Tuesday December 5 1911 I was showing Jimmie some work to do in the forenoon and I helped him and in the afternoon we cleaned out the old shop & granary. A fine day. 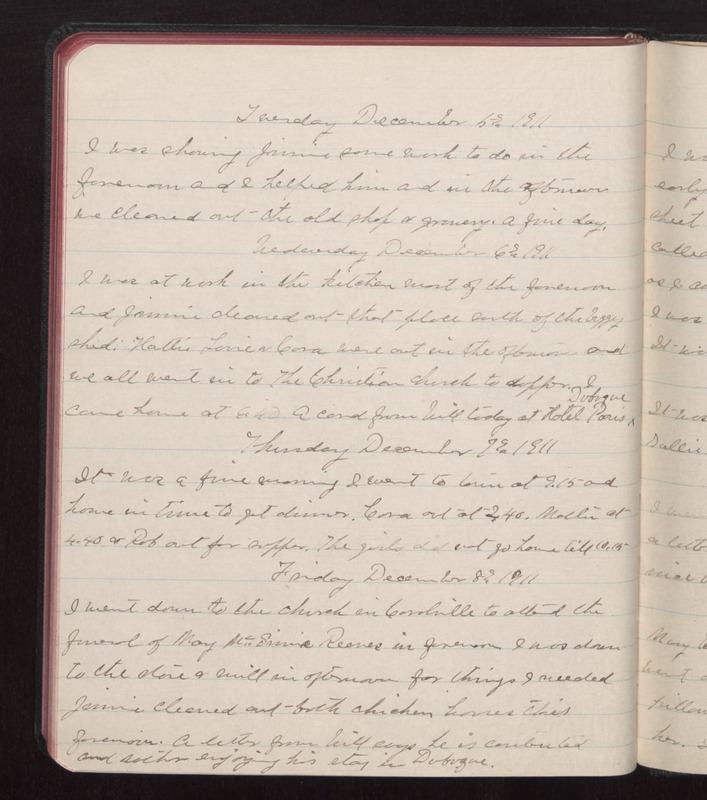 Wednesday December 6 1911 I was a work in the kitchen most of the forenoon and Jimmie cleaned out that place south of the buggy shed. Hattie [Lorie?] & Cora were out in the afternoon and we all went in to The Christian church to supper. I came home at 6.40 A card from Will today at Hotel Paris Dubuque. Thursday December 7 1911 It was a fine morning I went to town at 9.15 and house in time to get dinner. Cora out at 2.40. Mollie at 4.40 & Rob out for supper. The girls did not go home till 10.15 Friday December 8 1911 I went down to the church in Coralville to attend the funeral of May [McGrivie?] Reeves in forenoon. I was down to the store & [illegible] in afternoon for things I needed Jimmie cleaned out both chicken houses this forenoon. A letter from Will says he is [illegible] and rather enjoying his stay in Dubuque.